Comments: Jacinto V. Pereira was an Englishman, who operated the Fidelity Bank in Scottsville. 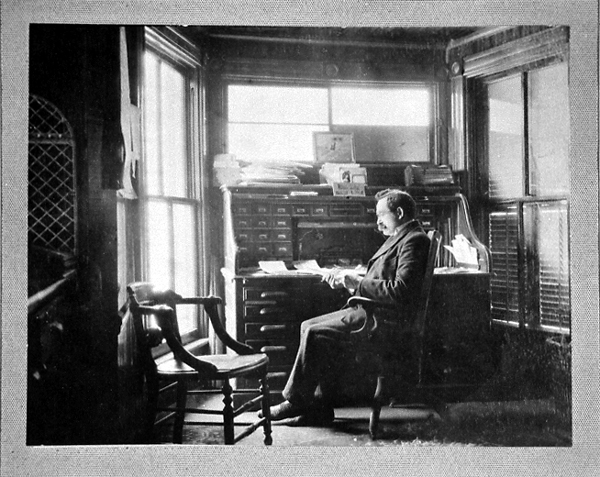 Shown here in his bank office, Mr. Pereira also served on the Scottsville Town Council and built the Travelers' Rest Hotel on Main Street, where he resided until his death in January 1925. In 1940, the old Fidelity Bank and two other buildings were torn down to make way for the gas station that currently occupies the eastern corner of Valley and Main Street. The Travelers' Rest Hotel, which sat near the corner of south Main and Valley Street, burned to the ground in a February 1976 fire.